A recap of the Minnesota point-man's Manila trip over the weekend. Lebron James wasn't the only NBA superstar in town last week. 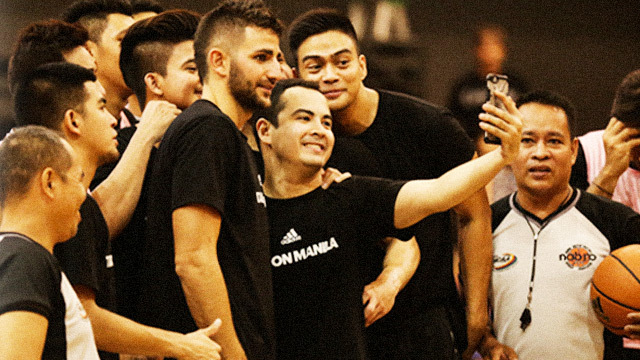 During the weekend, the Minnesota Timberwolves' assist maestro, Ricky Rubio, made the rounds in the streets of Manila for his adidas #TakeOnManila tour, promoting adidas' newest kicks, the Crazylight Boost 2015. The Spanish point guard kicked off his #TakeOn tour with a press conference on Friday, August 21, at the adidas store at Two Parkade, BGC. Despite the gloomy weather, the 24-year-old floor general enthusiastically conversed with the media, answering questions about basketball and his personal life. One of the more interesting things he said was that he had been really eager to come to the Philippines. He was part of the Spanish team that competed at the FIBA World Cup last year held in his native Spain. There, he witnessed how our team competed with #puso, and saw how passionate Pinoys are when it comes to basketball. "I have much love for the Philippines last year when they were in Spain, and the fans of the Philippines won an award for that. I want to see that kind of passion personally," shares Rubio. "I was really excited to come to the Philippines because I heard that basketball is a style of life here, and I can really sense it," he continues. Feeling the warm reception from the crowd, Rubio hinted at a potential return in the future. "There's no doubt [that] I'm going to come back here. I just really want to thank everybody for loving basketball because I'm the same and I can see that everybody has a passion for the game," quips the playmaking phenom. Fans who braved the storm got a warm reward as they got the chance to meet and greet the Spanish baller up close. After the press conference, Rubio went to Intramuros to experience the streets of Manila. The weather wasn't so kind but it definitely didn't stop him from lacing up and play some hoops—in Pinoy street ball fashion. Celebritities and adidas brand influencers like Solenn Heussaff, Karylle, and Chris Tiu were also present at the event. College hoop stars were also there to greet the NBA point guard. The weather might be crazy, but the drizzling certainly didn't faze them from playing a little free throw shooting contest. Here's Chris Tiu leading the charge, doing what he does best—shoot! Solenn, on the other hand, got to buy some baskets and a loud cheer from the watching crowd. Of course, Ricky also joined in on the fun and swished a few hoops as well. The next day, August 22, Ricky headed down to the Gatorade Hoops Center in Mandaluyong in continuation of his Manila tour. He was greeted with a packed gym and tons of fans hoping to have a picture and an autograph. While at the gym, Ricky shared a few personal anecdotes of him falling in love with the game while growing up. He also participated in a couple of light basketball drills with some lucky young hoopsters which were still in awe of the NBA guard. After the drills, Ricky got to toss the jump ball for a friendly pick-up game between college basketball stars and celebrities. Here's UST forward Aljon Mariano showcasing his point guard skills. The Ateneo Blue Eagles' Thirdy Ravena shows off his best no-look-dime ala Ricky. Perlas Pilipinas' Sofia Roman might be the only girl among the group, but her hot shooting sure convinced everybody than she can hang with the big boys, too. She's also our new hardcourt crush, too! ...and Kapuso star Mark Herras.